Some say voters didn’t give Obama credit for an improving economy. The down-in-the-dirt truth is that Middle America is still hurting. A look at one indicator sums up the reality for working families. A week after the Republican election “wave” saw GOP capture the Senate, expand its majority in the House to levels not seen since the 1940s, expand its control of governorships, and attain a level of power within the state legislatures not seen since the 1920s, a big question is still being tossed around by pundits, political operatives and investors: What does it all mean? Some believe the election was a repudiation of President Obama's leadership style as well as Democratic policies. Before the election, Obama himself had said his “policies are on the ballot,” as numerous campaign ads pointed out. Yet after the midterms, Obama tried to control the damage by saying he interpreted the results as a vote against the gridlock and partisanship we've seen over the last few years. Others on the left go further, saying that Democratic policies such as marijuana and the minimum wage won despite the GOP's gains, and that voters — the ones that turned out — just didn't give Obama credit for the economic gains we've seen. These include an unemployment rate that has now fallen to 5.8 percent — a level not seen since the summer of 2008, as well as a stock market pushing to record highs and the best run of payroll creation since the dotcom boom. Yes, U.S. large-cap stocks have never been higher, thanks mainly to the injections of cheap money by the Federal Reserve. And that has unarguably boosted household wealth in this country. The problem is that wealth is increasingly concentrated among the top 1 percent while everyone else looks enviously in on the action. According to the latest Federal Reserve Survey of Consumer Finances, the average value of financial assets held by those in the middle 20 percent in term of income was $78,300 (vs. $1,616,000 for the top 10 percent in terms of income). So the benefits of the rise in the Dow has been concentrated at the top, a problem that Fed Chair Janet Yellen herself has commented on. It is true there has been great progress in bringing down the unemployment rate. In fact, it's falling faster than many envisioned, nearly hitting the Fed's year-end 2015 forecast of 5.4 percent to 5.6 percent almost a year ahead of schedule. But what's missing in this has been the collapse in the civilian labor force participation rate to levels not seen since 1978 as people have dropped out of the job market. There are many reasons for this, including apathy, obsolete or inadequate skills, and old age. Yet the end result is the same: Not only are 3 million fewer Americans working full time than in 2007, but as a share of the population, full-time employment is languishing down near early 1980s levels. While recent payroll gains have been strong, totaling an average of 240,000 per month in the five months to October, with another 214,000 gained last month, this is masking the fact that many of the job gains are of relatively low quality, such as bar and restaurant jobs. You know things aren't good when the prices of vices like prostitution, drugs, gambling, and alcohol are on the way down. 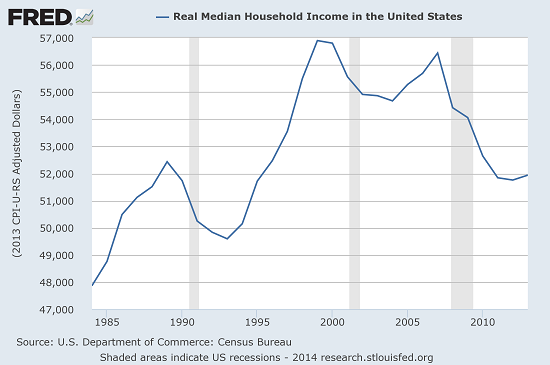 The easiest and quickest way to realize that Obama's economic recovery hasn't benefited middle-class families as much as the headline economic figures suggest is to simply look at the chart of inflation-adjusted median household income. This is arguably the single most important economic indicator and really sums up the on-the-ground reality for working families. Yes, stocks are up. Yes, unemployment is down. Yes, jobs are being created. And yes, oil prices have come down too. None of this really matters unless it all can combine to lift wages and lower the cost of living. Right now, incomes are down nearly 9 percent from their highs in the late 1990s and have fallen about 4 percent since Obama took office. Until this measure improves, the electorate will be restless. There is some evidence that a turnaround could be coming soon. In a recent column, I outlined the growing evidence that a surge of wage inflation could be on the horizon. This assumes that the economic momentum that we've seen in recent years continues. The unemployment rate has dropped down to level that, in the recent past, have been associated with a pickup in the pace of wage gains. My hope is that Obama and the Republicans in Congress can keep the momentum going by removing regulatory roadblocks to hiring — such as the full-time provisions of Obamacare and extending tax breaks to small businesses expanding their workforces — to help facilitate this. The worst of all outcomes would be the return of bitter partisan gridlock, a loss of economic confidence, and the stalling of job gains just as Americans were about to enjoy a lift in take-home pay for the first time in years.